Matey's screams had awakened everyone on that corridor - except Con, who was now sleeping soundly. They were all struck dumb at the sight of "Father Christmas" struggling in the doorway of Leafy. "Send for Gaudenz" yelled Emerence, "he'll know what to do!" Gaudenz, roused from sleep simultaneously by the phone ringing and someone pounding on his door, didn't know which emergency call to answer first, so very sensibly he ignored both and went back to sleep. But the pounding on the door continued and unable to stay asleep for long, Gaudenz made his way to the his door. He was startled to find Matey standing there gabbling something about Father Christmas stuck in a doorway. She dragged him out and up to Leafy where he found the unfortunate Nell still struggling. By now her hat and beard had come off and he recognised her at once. "Ho ho ho!" he chortled and with one big tug he freed her. Then he looked at the large hole in the wall by which means Matey had exited Leafy (the doorway being blocked). "Who is responsible for that?" he roared. Matey promptly, and conveniently, fainted. While Matey lay still, grey and to all appearance dead, Nell escaped and dashed past all the chaos. She ran out past the playing field and through the gate into the Freudesheim garden. She was just in time to see Joey, wearing a lime-green dressing-gown and with her earphones uncoiling and flapping, standing with Jack. looking down on the now recovering figure of Tristan Denny. However, upon seeing Joey dressed only in her dressing gown, which was gaping open, Mr Denny passed out once more. As did Nell. Jack looked up just in time to see her collapse. "Oh my god!" he yelled, dropping Mr Denny on the floor, "Jo! It's happened again, Santa has drunk too many sherries and I am going to have to deliver the world's presents. Round up the reindeer and fetch my sledge!" "But what about Jem and Madge?" answered Joey, "They will be arriving any minute now!" And indeed, the headlights of an enormous car were to be seen heading up the drive. "Tell Jem he is going on the naughty list!" replied Jack. "No, Jack, you are the one who's on the naughty list," said Jem sternly, blocking the door so that Jack was unable to leave. "And I wish you'd all learn to keep those clear, bell-like tones down: people must be able to hear you at the Auberge, never mind from the drive. And stop talking such rubbish. Father Christmas is absolutely fine. I should know: the Chief Elf is an old school pal of mine and we've just been speaking on the phone. Anyway, none of the reindeer'd come here because they'd all be too worried about that horrible dog jumping all over them. Shove Tristan in a chair somewhere and leave him to sober up: the drinking culture in the Chalet School staffroom is one of the things Madge is here to put a stop too. And I want a few words with you about the goings-on at the San." Upon hearing Jem's words, Nell came round with a loud squawk. This caused Jo to swing around towards her, making her dressing gown swing completely open. Nell promptly fainted again, followed this time by Jem. "What on earth is going on here?" demanded Madge, appearing at the door. However, Madge was distracted from her righteous indignation by the sight of the drunken and staggering Tristan Denny. She quickly smoothed her curls and batted her eyelashes at him coyly. Before Madge could drag Tristan to any private place so they could get that loving feeling, a clarion scream awoke everyone who wasn't awake already. Except Con Maynard, who started murmuring 'brains...' (which probably meant she was thinking of a Welsh brew). "Oh God, Mary-Lou's getting murdered again," Jack rolled his eyes. "Now can I leave?" Jem sighed. "We'd better find out who did it this time,"
They went off, followed quickly by the cavalry and a beer-zombie. Mary-Lou's body, still, grey, and to all possible physical descriptions dead, lay under the weapon that caused it to be such. A giant pile of candy canes. In the corner, unnoticed to all of them, was a naked lady holding a lamp. "Good lord!" said Jem, in his most pompous manner, "The Candy Cane Killer has struck again!" "The who?" asked Jack in confusion. "The Candy Cane Killer," repeated Jem, "The Chief Inspector of the Metropolitan Police was telling me all about it when we were in conference the other day." Neither of them noticed the naked lady, who was slowly raising the lamp to head height. "Goodness Hilda, somehow I had never pictured you with tattoos," said Jem in some surprise, easily dodging the missile. "And such - original - ones too. Did they hurt?" "Rubbish!" Hilda replied, "I think you need glasses if you think it's all tattoos. Nell gave me this onesie for Christmas, it is quite effective isn't it?" As Jem lent forwards for a closer look Hilda smacked him over the head with the lamp. However, instead of knocking Jem out, it merely bounced off his head and rebounded into Hilda's nose, resulting in a nose bleed of epic proportions and the nose itself turned bright red, like a certain reindeers nose. Jem appeared not to notice that he had been hit on the head as he examined Hilda's onsie. Jack however, realised that there was something odd about Jem's head. Antlers sprouted from his head. His face and body began to change shape and fur appeared all over his body. Jack stared at the reindeer standing in front of him. "Jem" he yelled "What has happened to you?" 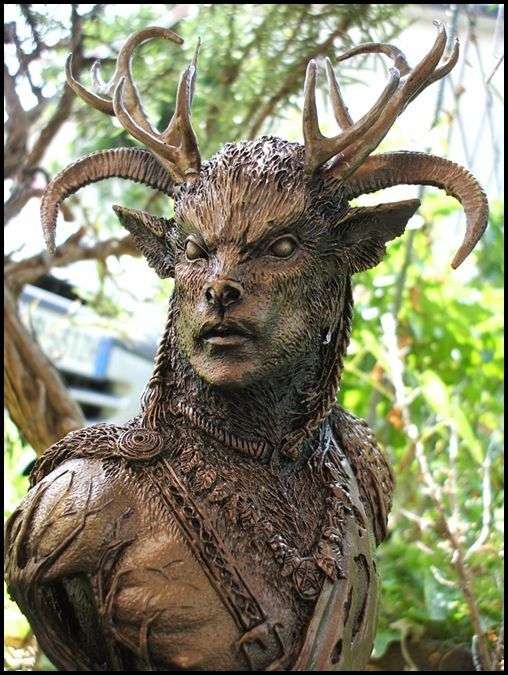 "I am returning to my true form of Herne the Hunter" intoned a voice from deep within Jem's chest. "I have too long been trapped in a puny human shape but now this transformation cannot be stopped. Look on my works oh weak and feeble mortals, and despair!" "Jack, what are you staring at?" asked Madge in bemusement. "It's Jem," stuttered Jack. "He's turned into a reindeer." Madge, Hilda and Jo all turned to Jem. He looked exactly the same as usual - which wasn't saying much, admittedly, but he was certainly still in human form. Hilda sighed. "He's been drinking those doses he and Matey concoct for patients at the San," she explained to Madge. "Come to think of it, I think Tristan might have been at it as well. Neither of them can handle it. Never affects Nell like this." "I should never have trusted Jack to run the San out here," groaned Jem. "The things that've been going on! Spreading confidential information all over the Platz, accepting lottery tickets from patients, and now this. Enough is enough. From now on, my niece Daisy is the senior doctor around here."